Meeting strangers isn’t as, well, strange as it used to be. With Tinder, Meetup, and a host of other apps designed to initiate real-life fraternisation between online acquaintances, meeting new people is now just a couple of clicks (or swipes!) away. One Singaporean, however, is taking this to the next level. 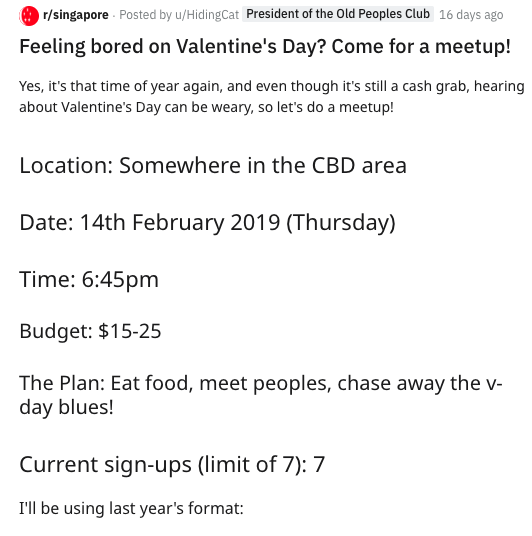 Over the past two years, Lee Yuan Sheng (better known as HidingCat) has organised almost twenty-five meetups between complete strangers from the local sub-reddit, r/Singapore. For the uninitiated, Reddit is a forum similar to HardwareZone or Stomp. The difference is that Reddit is used internationally, with many nations having their own country-specific pages, or sub-reddits, for locals to discuss local issues. Singapore’s is r/Singapore (or r/Sg as it’s known to natives), and browsers of the site are identified by their username, such as Yuan Sheng’s which is ‘u/HidingCat’. In person, the thirty-nine-year-old appears unremarkable. Apart from an unusually clear and lucid manner of speech, he is a stock photo reproduction of a Singaporean Chinese male. On r/Sg, however, he’s something of a cult celebrity, and slots for every meet-up session are usually snapped up in less than twelve hours. His story begins in the mid-90s. Picture grainy photographs, coin-operated telephones, PM Goh Chok Tong. A young man (this is Yuan Sheng, though he’s more of a boy) sits alone in the school canteen. “I would just eat my packed lunch alone, never buying anything, because that would mean actually having to talk to someone. I was painfully shy,” he shares. He began using HardwareZone in 2000, revealing that he was actually one of the founding members of the local photography forum, ClubSnap. While Singapore has its own local-only forums, like HardwareZone’s Eat-Drink-Man-Woman (EDMW) and Stomp, younger Singaporeans are gravitating mostly towards r/Sg. Additionally, Reddit is a one-stop-shop for young people from all over the world to form communities around specific interests, from Greenland to gardening to gastroenterology (as of writing this article, r/gastro has 93 subscribers). This creates a positive environment for discussion on a specific topic by enthusiasts, hobbyists, and professionals alike. This is why Yuan Sheng believes the internet is still a place for thoughtful dialogue, an idea that I myself gave up on a long time ago. When I bring this up, he laughs. At the turn of the millennium, the internet was also a much healthier environment; trolling and fake news didn’t exist, and people who met online often formed genuine, authentic, and meaningful relationships. Yuan Sheng hopes that the internet can once more be a force for good—an optimism that I envy. I ask him whether modern online forums, like r/Sg, can be as beneficial for (lonely) individuals as UseNet was for him. And as a moderator (think: forum cop) on r/Sg, HidingCat and his fellows are working to prevent it from becoming such a space. Doxxing is essentially an online version of witch-hunting, where a user’s personal details are sourced and revealed, usually for malicious purposes; an incident involving a certain Go-Jek passenger and the subsequent harassment she suffered comes to mind. Owing to his position as moderator, Yuan Sheng is up-to-date on subscription and demographic numbers for the forum. 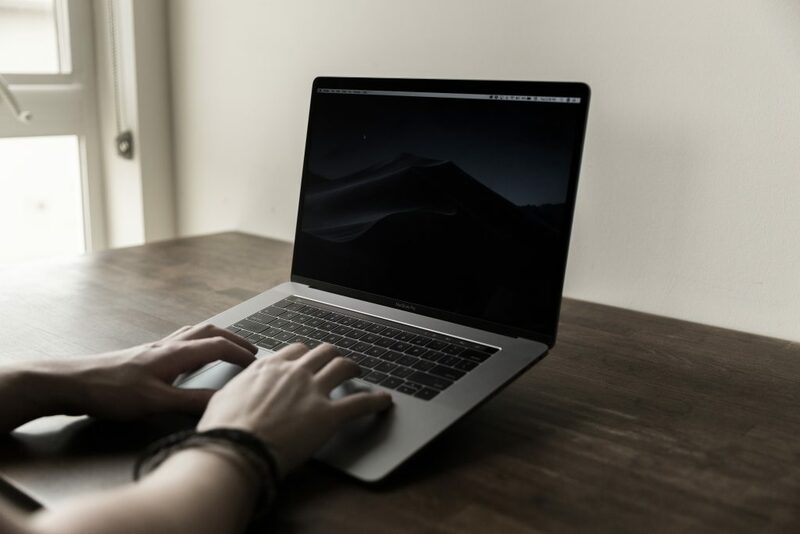 He points out that this rapid growth is composed largely of young people, as the forum’s users are mostly eighteen to twenty-four years old. It’s also these youngsters that Yuan Sheng is most concerned about. In early 2017, he noticed that there were a lot of people on r/Sg who were lonely, and needed some form of social activity. Most were under twenty, still in school, or serving National Service (NS). This was when he decided to initiate a real-life fraternising session, and it became the first ‘Sambal Stingray Meetup’. 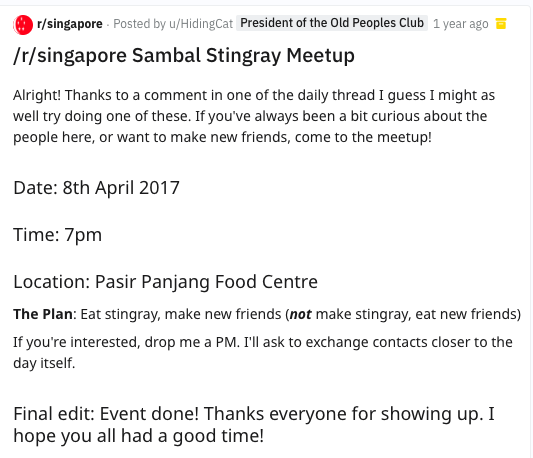 Since then, HidingCat’s monthly meetup posts have become a fixture of r/Sg. Often, if he notices a particular account making several posts about being lonely and friendless, or afraid to converse with others, he drops them a direct message inviting them to the next meetup. To encourage the more reluctant ones, he even offers to meet them individually beforehand to reassure them that everything will go fine. “Once they know that there are people to talk to, they don’t feel so alone. They can learn that meeting people isn’t necessarily that hard,” he says. As the organiser of these meetups, Yuan Sheng is more than just an attendee. For much of the session, he carries the conversation, asking follow-up questions, telling stories, making jokes, until bit by aching bit the participants become more at ease and begin to engage with one another. The man is a walking icebreaker, which requires a fair helping of both trained charisma and deliberate effort. A word bubbles to the surface of my mind: influencer. Not one who influences fashion, through curated images, but one who influences people, through thoughtful words and consideration. It isn’t all hard work though, since Yuan Sheng enjoys getting to know people. Still, Yuan Sheng restricts the slots for each meetup to seven people; eight including himself. Initially, this struck me as a bit of a gimmick; as if to make the meetups more exclusive so people are motivated to attend. Obviously, I was wrong. HidingCat’s meetups are meant for the bored and lonely. I’m taken aback: even the group size is supported by deeper considerations for human interaction. Yet this is the crux of it. 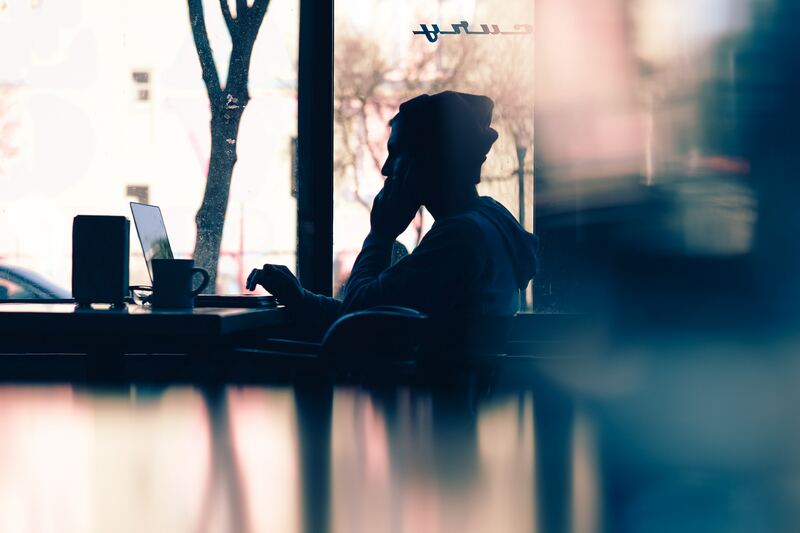 If he can help, even a little bit, to assuage the loneliness and isolation experienced by many young people, a feeling all too prevalent in our office-cubicle world, it will be worth it. The days of referring to the Internet with a capital-I are over. Online culture is human culture; online life is real life. Facebook and Twitter are forces as dominant in the political sphere as Bloomberg and Reuters, perhaps even more so. Reddit has not yet caught global attention in that way, but does Yuan Sheng think that r/Sg will ever hit a critical mass of youth to have a significant impact on life in Singapore? “We are starting to enter into mainstream consciousness,” he says, pointing out how even the Straits Times has often used images or stories from r/Sg. Hell, this entire story is about the forum. Astroturfing refers to the deceptive practice of orchestrating a public relations campaign in the guise of unsolicited comments from the public. In this case, various Reddit accounts were created for the express purpose of promoting certain political ideas or corporations, with these intentions being hidden beneath the guise of being the ‘average Singaporean’ opinion. While the future is unknowable, at present, r/Sg’s impact is limited by its youthful demographic. That may be true now, I argue, but eventually, these kids are going to grow into adults; adults with significant perspectives on government, policy, and CPF. Yuan Sheng answers that it depends on what their mindset regarding r/Sg is. For many, the forum is a place to unwind and have a laugh or two. If young people aren’t as politically conscious, or as interested in engaging critically with ideas that they see, it’s not just disingenuous public relations campaigns and astroturfing that threatens them. They could be vulnerable to crafted political narratives and poisonous mistruths that impact their perception of reality . 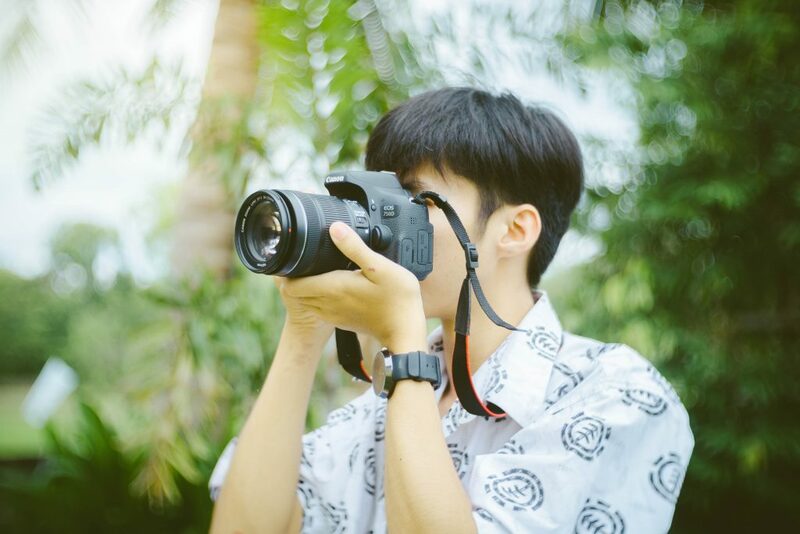 You may not know his face, but to the people of r/Sg, HidingCat is Singapore’s most underrated influencer. In his own way, Yuan Sheng is working to recreate the internet of his youth in our local corner of Reddit; an internet composed not of needlessly antagonistic trolls, but of thoughtful, considerate people. True to his moniker, he is the man who tries, anonymously, to make a difference. The uninitiated may view internet-meetups as ridiculous or pathetic, but Yuan Sheng is someone who saw a problem and tried to do something about it. How many of us can ever say they did the same?